Lusaka — PATRIOTIC Front (PF) president Michael Sata has written to Chief Justice Ernest Sakala asking him to appoint a team of three doctors to investigate President Levy Mwanawasa’s illness. And Sata yesterday said justice Sakala promised to react to his concerns about President Mwanawasa’s health after making consultations. 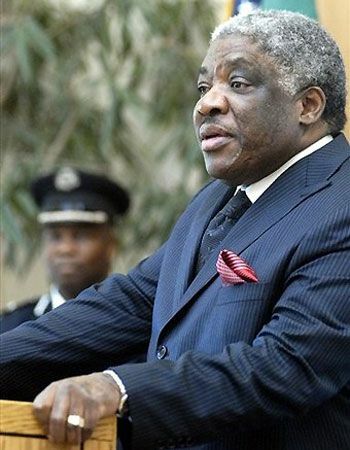 In a letter dated April 7, 2006 which was copied to Vice-President Lupando Mwape and Speaker of the National Assembly Amusaa Mwanamwambwa, Sata stated that he was prompted to write because he was concerned about President Mwanawasa’s medical condition. “On 31st March, 2006, the nation was informed through a terse press report that the President had been evacuated to a London hospital. There have since been no further detailed reports on his medical condition. tion. The nation is entitled to daily medical bulletins on the state of its President,” read the letter in part. “I am aware that, ordinarily in such cases, the process of investigations into the medical status of the President ought to be initiated by Cabinet. Sadly, Cabinet seems to be moribund and has failed to perform its constitutional functions in this respect. And Sata said he wrote the letter to the Chief Justice because the well-being of the President was a national issue. He said it was unacceptable for the nation to rely on casual and childish statements from the government. “In Bemba we say, ubulwele bwa mfumu li tensha chalo (when a chief is sick it affects the whole nation). So they can’t keep our President’s sickness as a secret. When the late Pope John Paul II was sick, the whole world was informed on an hourly basis on his condition until he died. Even on Ariel Sharon they have been updating us,” Sata said. Sata advised Vice-President Mwape to regulate his speech when it came to national matters. “Is Lupando telling us that the President went with his delegation to London just to go and jog? And in London there is no hotel where you are expected to pay less than US $200 per night. So is he telling me that the government is spending all this money just for jogging? Let’s be serious with things we say to our people,” he said. Sata said the Constitution stipulated that if the President was incapacitated, Cabinet was supposed to convene. “That’s why we have written to the Chief Justice requesting him to appoint a team of three medical doctors to assess the President as per constitutional requirement. We need to be updated on our President’s health as a nation,” he said. Sata said he personally delivered the letters to the Chief Justice and the Speaker of the National Assembly. “I met the Chief Justice and he promised to get back to me after he has made consultations. I also met the Speaker and he said he will wait for correspondence from the Chief Justice,” he said. Article 36 of the Laws of Zambia stipulates that: “(1)If it is resolved by a majority of all the members of the Cabinet that the question of the physical or mental capacity of the President to discharge the functions of his office ought to be investigated, and they so inform the Chief Justice, then the Chief Justice shall appoint a board consisting of not less than three persons selected by him from among persons who are qualified as medical practitioners under the law of Zambia or under the law of any other country in the Commonwealth, and the board shall inquire into the matter and report to the Chief Justice on whether or not the President is, by reason of any infirmity of body or mind, incapable of discharging the functions of his office. “(2) If the board reports that the President is incapable of discharging the functions of his office, the Chief Justice shall certify in writing accordingly and shall table such certificate, with the report of the board before the National Assembly who shall on a motion, passed by a two thirds majority- (a) Ratify the decision of the board, and thereupon the President shall cease to hold office…” Over a week ago, President Mwanawasa was flown to London for medical review after he fell ill.
And on Friday, Vice-President Mwape assured the country that President Mwanawasa was in good health and jogging in London. But on the same day, information minister Vernon Mwaanga said the President was making tremendous progress and that there was no need for the nation to panic. Meanwhile, the case in which Sata, Dr Guy Scott and police officer Clement Andeleke are charged with defamation of the President was yesterday adjourned indefinitely.